Sonos has revealed that it has been busy working on an Android app for its popular wireless Sonos music systems, and that the application will be released in the UK in March. The Sonos controller app for the iPhone and iPad gave you the ability to control your Sonos system through your phone, meaning that you didn't have pay out for the official Sonos controller to control devices like the Sonos ZonePlayer S5. John McFarlane, CEO of Sonos, spoke to TechRadar about the new Sonos for Android app, explaining: "We think we make a perfect pairing for Android. It has taken a year to get the application sorted but we think it will be one of the best on the Market. 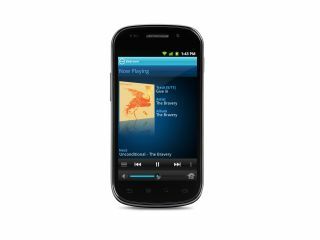 "By entering the Android world we are going to be the best music system for Android. It will bring Spotify into your house, as well as Napster and a variety of these services. "It is the same theme [as the iPhone controller] of pick a room, pick a song and you can start playing." The Sonos for Android app is completely free and is compatible with all of Sonos' products. It isn't compatible with all Android products, though, as you will need to have Eclair (Android 2.1) and above. It is also recommended that you have a larger screened phone. Sonos is saying that the app is best used on a screen size of HVGA 320 x 480, WVGA 480 x 800 or WVGA 480 x 854. The Sonos for Android UK release date is late March, but TechRadar will be getting its hands on the device at this year's Mobile World Congress in Barcelona.